Home security comes at a price, but that price is lower now than ever before! Today, even the cheapest home security cameras come with superb picture quality, darkness-piercing night vision, and sophisticated motion sensors. They’re also connected wirelessly to your smartphone, enabling you to monitor the situation at home and receive alerts as soon as an unforeseen situation arises whether you’re out grocery shopping or on a business trip overseas. Below are six of the best home security cameras you should consider if you’re on a tight budget but don’t want to compromise on quality and features. Here you’ll find both packs consisting of multiple cameras at irresistible prices as well as single models whose features and superb performance make them a steal. Whether you need to keep an eye out on a single room or ramp up the video surveillance of your entire home, you’ll find a solution among our picks which will get the job done without breaking the bank. Alexa support, free cloud storage, decent picture quality. It has adjustable motion sensors and night vision. Excellent image quality and great night vision range. If you’ve got a large front yard to monitor, you need a camera which can capture it in as much detail as possible no matter the time of day. 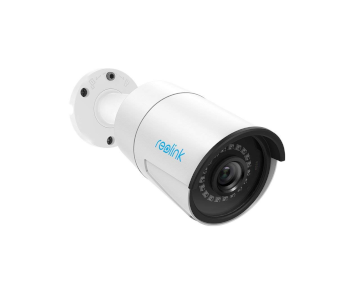 The Reolink RLC-410 is a versatile, durable, and inexpensive camera with a high resolution and excellent night vision. It takes minutes to install & pair and can be used outdoors as well as indoors. As all of these features won’t even set you back $70, so placing it at the top was a no-brainer. The RLC-410 is a sturdy bullet-shaped camera with a rugged aluminum exterior. It attaches to any hard surface with a hefty base that needs to be screwed in with three provided screws. It is completely waterproof and stands up to the elements well even if it’s completely out in the open. The camera draws power through an Ethernet cable so there’s no need to place it near an outlet. Its biggest selling point is the crystal-clear 80-degree view. At a resolution of 2560 x 1440, the RLC-410 is able to capture even far-away details like license plates or suspicious characters at the edge of your property with more detail than cameras that are more than twice as expensive. Its night vision is effective up to a range of 100 feet thanks to 36 infrared LEDs placed in a circular pattern around the lens. 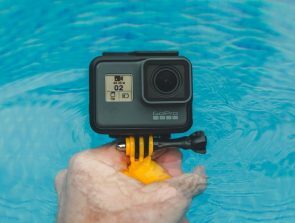 To record video footage locally, you’ll either need to get an SD card or purchase one of Reolink’s storage devices with a capacity of up to 3TB. The RLC-410 provides a 24/7 live stream you can tune into either through a web browser or the accompanying smartphone app. The pairing approach is easy and only involves scanning a QR code on the camera. From the app, you can monitor the live view, take pictures, or record footage manually. This model is also equipped with a motion sensor. When triggered, it will make the camera record a short clip and send you a notification via email. These clips can then be reviewed in the app. Supplying power to the camera through an Ethernet cable may require the use of a Power Over Ethernet (POE) injector, which the package doesn’t contain. Once installed, the camera can’t be tilted or panned, so you’ll need to find an optimal angle first. No matter how much an indoor camera can be adjusted and how wide its viewing angle is, it can only monitor a single room or hallway. The only solution is to buy more cameras, which can become quite costly. 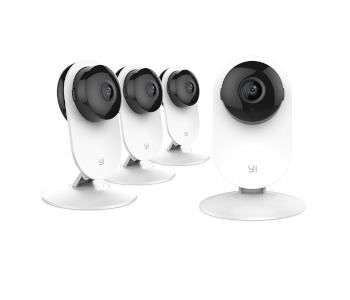 Yi is a Chinese security camera manufacturer that offers quality cameras at bargain prices, so much so that you’re able to snag four of them for less than $100! The cameras feature two-way audio, have pan & tilt, and come with a range of storage options. Yi’s cameras may be cheap, but they are NOT cheaply made! Each has a hefty base with a non-slip rubber coating and a long cable so you can set them up away from an outlet. The top part houses the lens and 8 IR LEDs. It can be rotated as well as tilted up & down to a degree. This is also where the camera’s two-way speaker system is located. The speakers are loud enough to scare off burglars and can be used as an effective intercom system too. Each camera has a unique QR code for easy pairing with Yi’s smartphone app. You can choose between standard and HD 720p resolutions. This is lower than today’s 1080p standard, but more than enough to give you a detailed overview of any room in the house. The field of view is set at 111 degrees and encompasses the entire room without distorting the image at its edges. At 10 feet, night vision is bright enough for indoor use. It also doesn’t suffer from contrast issues if an object is too close to the camera. Yi gives you plenty of storage options. The cameras have microSD slots for local storage, but seven days of footage can be accessed freely from Yi’s cloud as well. If you want the best experience which includes 30 days of storage and support for five cameras, you will have to pay $15/month. The app offers in-depth customization of the cameras’ behavior. Through it you can simultaneously monitor all their video feeds, view a timeline of videos & screenshots, or access cloud storage. The infrared LEDs on most security cameras will turn on automatically when there’s not enough ambient light. You can choose to turn Yi’s night vision mode off completely. Motion sensor triggers are also supported, and their sensitivity is adjustable. The cameras connect to your phone via Wi-Fi. They only support a 2.4 GHz connection and have intermittent connectivity issues. Sometimes a camera or two will be dead on arrival, which is unsurprising given the quantity produced. Yi will send you working replacements if this happens, but waiting for them can be frustrating. A good security camera should be able to focus on any part of the space it is guarding, and that’s where panning, tilting, and zooming are instrumental. 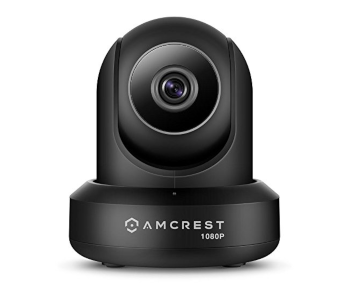 Amcrest’s ProHD is a camera which can pan a full 360 degrees, tilt 45 degrees, and digitally zoom in on the action 3 times. It’s an unobtrusive and affordable camera that offers excellent picture quality and two-way audio. 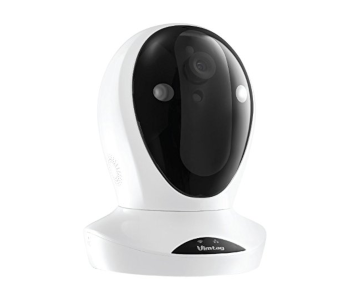 The ProHD is perfect as either a nanny cam or a full-fledged security camera as it has excellent night vision and a clear two way-audio connection. It can be placed on a flat surface or mounted on the ceiling for a better vantage point. The motorized pan & tilt functions are almost noiseless and quickly direct the lens where you need it to be. 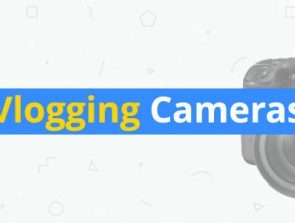 The camera comes with a 10-foot power cable and connects to your home network either wirelessly or via a provided Ethernet cable. The image quality is excellent and deeply customizable. At its default settings, the camera delivers a balanced, sharp picture during the day and 30-foot black & white night vision when there’s not enough light. You can customize settings like color saturation, gamma, and white balance to get an even better output. Digitally zooming into part of its 90-degree field of view will result in minor quality loss, but most of the details remain preserved. The camera’s settings and controls are accessed through either a web or a smartphone app. You’ll use the former more for configuration as some settings are exclusive to it. Whichever app you prefer, controlling the camera’s movement, making a recording, or speaking to someone is straightforward, although the latter comes with a slight delay. The web app is essential for using the ProHD to its fullest, so it’s surprising that it is so unstable. The app works only with Microsoft Edge and Mozilla Firefox. Amcrest’s monthly plans are expensive given what they offer. If you choose not to pay, you only get 4 hours of storage per month and can tune into the live stream for only 2 hours. $6/month per camera gets you 7 days of storage while 30 days costs $30/month per camera, making investment into a multi-camera setup like Yi’s prohibitively expensive in the long run. The P1 was a successful model which won customers over with its extensive scheduling options, cheap price, and above average video quality. Its new Ultra version is just as cost-effective and has numerous improvements including a higher resolution, support for Vimtag smart sensors, and even more settings when it comes to motion tracking and scheduling options. The P1 Ultra sports the same pod-like design of its predecessor and is small enough to find its place on a desk or bookshelf overlooking the monitored room. A mounting kit is part of the package too so you can set the Ultra up on a wall or ceiling. Its lens has a 70-degree field of view. That’s a little on the narrow side, but the 320-degree pan and 120-degree tilt make up for this. Power is drawn either from a USB adapter or through POE. You even get the injector if Power Over Ethernet is your preferred power & connection method. Video output looks well-rounded during the day and night vision does a good job of illuminating the camera’s surroundings at a maximum range of 25 feet. The original’s 720p resolution has been bumped up to 960p and 4x digital zoom has been added. The audio quality has been increased as well and now you’re able to clearly hear and interact with people in a monitored room. This camera doesn’t come with a subscription plan. Rather, storage is handled locally. Without any kind of storage medium, you can only check the live feed and store pictures of it on your phone. You either need an SD card or the Vimtag S1 Cloud Storage Box to store video clips. The box has a high up-front cost, but it has a capacity of 1TB and you can connect to it remotely through any computer or smartphone. The camera is very sensitive to light. 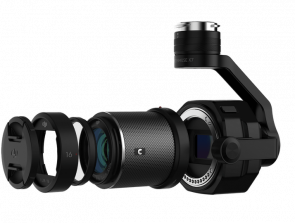 You’ll need to place it so that sunlight doesn’t come into contact with the lens during the day or else video footage quality will suffer as the contrast becomes too pronounced. The motion sensors are extremely sensitive by default. You’ll need to tone them down or else your phone will get bombarded with false activity alerts. Being connected to and able to influence other smart home devices is ordinarily reserved only for high-end security cameras, but the Momentum Cori HD promises this won’t be so forever. While its smart connectivity is rudimentary at this point, future updates will bring support for both IFTTT and Amazon Alexa. In its current state, the Momentum Cori HD is still a worthwhile purchase as you’re getting two 720p cameras with nice image quality and responsive sensors for a bargain price. The Cori cams are among the best-designed affordable security cameras we’ve seen. Their oval black casings are elegant and the cameras themselves are small enough to be concealed. There’s no pan function, but you can tilt a Cori to a degree to get a better angle. The cameras are powered through a microUSB port and have a microSD card slot that supports cards with 128GB of storage. Daytime video quality is good for cameras at this price point. The 720p resolution coupled with a 110-degree field of view means you can expect a clear overview of a single room. The non-Cori version of the Momentum had sub-par night vision. This has since been remedied as 8 LEDs emit enough light to outline everything clearly at night 25 feet away. These cameras have both motion and sound sensors. The latter are particularly useful at night and will send notifications to your phone even if there’s activity outside of a camera’s sight range. 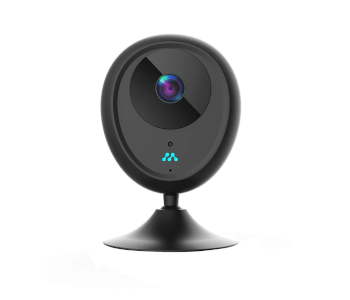 The Momentum app has a lot in common with that of the Wyze cam – it is clearly laid out, features are grouped together logically, and there are many adjustable settings. Each camera has its own dashboard complete with video monitoring, audio communication, and one-tap recording. The “Rules” section is where you’re able to set up how and when each sensor type functions as well as manage zones for the motion sensors. The only smart connectivity feature available now is the integration of Nest’s Smart Learning Thermostat into the Momentum app so you can control both your security and HVAC systems from one place. IFTTT and AI assistant support will follow soon. Momentum offers payment plans for every taste. If you rely solely on an SD card, you can still get unlimited access to the live stream for free. $5/month gets you 7 days of history. $10/month is the better option since it includes 30 days of storage and unlimited downloads. While the app is functional and well-designed, it is prone to freezing. Sometimes it will stop working for a few seconds and then behave normally. Speaking of delays, push notifications are sent to your phone two minutes after the fact, giving potential burglars ample time to skedaddle. 1080p video, 14-day free cloud storage, sophisticated motion & sound tracking, and a 32GB SD card for local storage… all at less than $40? Sounds too good to be true, right? Not in this case – the 2nd version of the Wyze cam is really all that it’s cracked up to be and more. 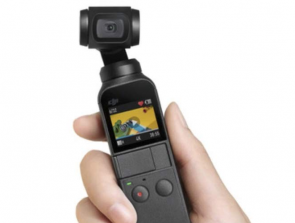 This tiny camera has better video quality and more features than better-known competitors while costing only a fraction of their asking price. Buy one (or three) and take advantage of the incredible deal. 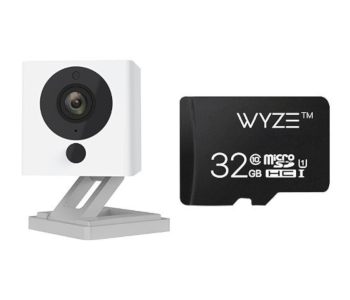 The Wyze Cam v2 is a tiny, box-shaped camera with a magnetized base you can also attach to non-magnetic surfaces or walls with the included adhesive tape. It’s powered by a USB adapter but has an additional USB port so two Wyze cams can be powered from the same source. Getting it to work with your smartphone involves downloading the app, letting the camera scan a QR code from the phone’s screen, and naming the newly-discovered Wyze Cam. Like the P1 Ultra, the 2nd Wyze Cam has received notable improvements in both its audio & video performance. It features an improved CMOS sensor with 8x digital zoom capability as well as a new audio amplifier. The 1080p video is of very good quality with accurate colors and adequate contrast. Night vision is enabled by 4 IR LEDs bright enough to deliver usable footage at more than 20 feet away. The greatest hardware improvements have to do with the Wyze Cam’s sensors. Its overhauled motion sensors are more sensitive and enable motion tracking. When this feature is enabled, tracked objects will have an outline around them for easier identification. Sound sensors are a new addition. Their activation serve as the trigger for automated video recording and they can even recognize the distinct sounds CO & smoke alarms make. Detecting such a sound will push a specialized notification to your phone immediately. The Wyze app has a minimalistic design focused on easy access to frequently used features. Tapping on a camera’s view brings you to its live feed. From this screen, you can initiate two-way communication, take snapshots, or access video logs. More advanced options like sensor management and alert schedules are just one tap away. The Wyze Cam has a microSD slot that supports 32GB of storage. Alternately, Wyze offers 14 days of free 24/7 storage which get automatically overwritten. It even supports Amazon Alexa! Installing the Wyze Cam skill lets you bring up the feed on an Amazon TV, Echo Spot, or Echo Show with a voice command. The camera’s field of view is 110 degrees and is visibly distorted at the edges. This can lead to loss of detail. Whenever an alert is triggered, the camera will save a video clip of the activity that caused it. These clips are only 12 seconds long which might not be enough to properly identify what happened. Wyze Cam is amazing. The quality is impressive, especially for the price. I threw mine outside and it even held up in bad weather.